Do you have Creative Confidence? Do you think that some people are just born more creative, or do you believe that we can learn to become more creative? 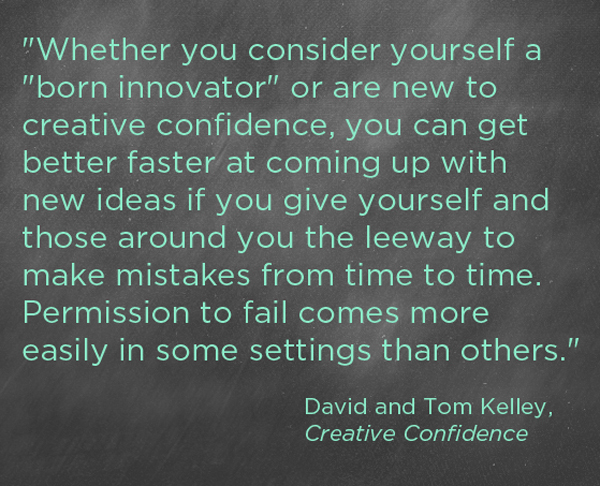 In the newly released creativity and innovation-boosting book, Creative Confidence, authors David and Tom Kelley not only explain that creative super-powers lie within each of us, but they go on to share actionable tools for increasing our abilities to innovate. 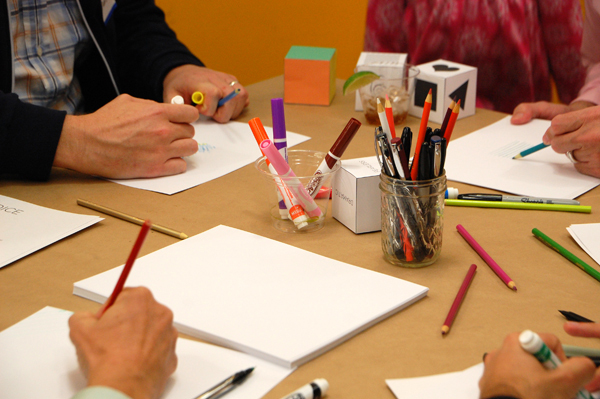 Stanford University’s K-12 Lab Network recently invited me to lead a hands-on maker workshop as part of the Creative Confidence book launch party for IDEO founder, David Kelley. 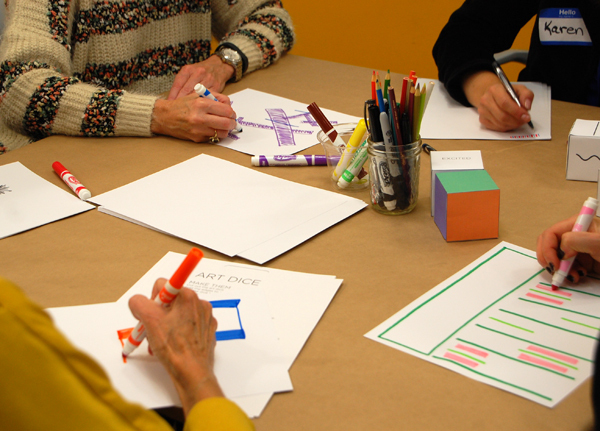 If you’re an educator who’s interested in Design Thinking, I promise that you’ll lose hours digging into the d. School’s K-12 Lab and the K-12 wiki. 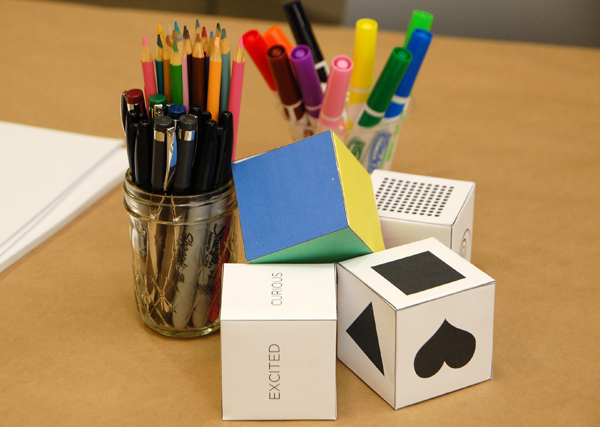 For the hour that led up to the highly anticipated panel led by David Kelley, we set up a fun creativity-booster with Art Dice in a room just off the main stage. If you’ve been following my blog for some time, you may recognize this game as Art Dice. 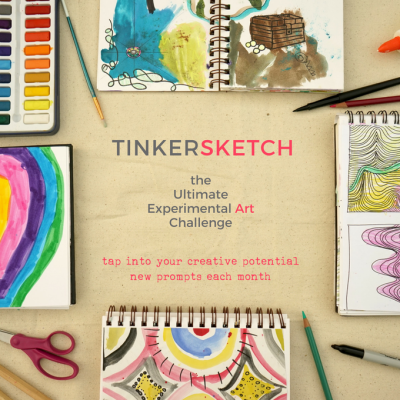 If you’re new-ish to Tinkerlab, here’s the original post. Art Dice is a fun prompt/tool/game for creating randomly generated art. Every flip of the dice becomes an opportunity to explore art vocabulary, drawing skills, color recognition, and shape identification. With a few changes, these dice could also used to chase away writer’s or artist’s block: Simply roll the dice and draw or write about what pops up. Combine a few dice together and rise to the challenge of combining disparate ideas into a cohesive whole. Since I needed a few sets of dice, and didn’t have the time to paint six sets of wooden dice (as I did with our original sets), I made paper templates and printed the dice onto heavy card stock. You can download them for free here. They’re bigger than our original dice, but the scale also makes them playful and visually arresting. The rules: Roll one die. Interpret what you see with mark-making tool/s in two minutes. We invited our players to roll the line die. The line die includes things like dots, straight lines, zig-zag lines, and a spiral. With the die rolled, they chose a mark-making tool and had two minutes to interpret the line on their paper. One of the most outstanding parts of this exercise, from an observer’s point of view, is to see the variety of interpretations. The rules: Roll two dice. Interpret what you see with mark-making tool/s in two minutes. For the next round, we rolled the line die and the shape die. Again, participants had two minutes to interpret these images in whatever way they desired. The rules: Roll four dice. Interpret what you see with mark-making tool/s in two minutes. 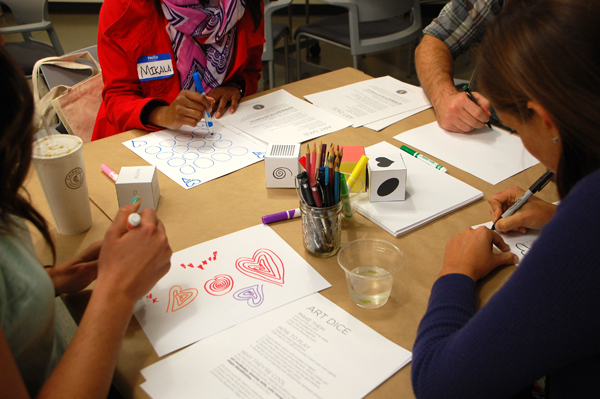 For the last round we invited the players to throw four dice: shape, line, color, and mood. The mood dice included words like curious, excited, and angry. From the four tossed dice, players could choose two, three, or four of the dice to work with and create a final composition in two minutes. You can see the variety of interpretations of the prompt in this last photo. Creative freedom to experiment: There was no wrong or right way to do this exercise, which offered many participants creative freedom to experiment. Good for team-building: A few participants suggested that this activity could be a powerful way to open up a team-building event. Prompts work differently for everyone: Some people felt more creative leeway when they only had one die to work with, while others preferred the challenge of working with multiple dice. This reminded me of how differently our brains work, and how prompts like this are not one-size-fits all. I would venture to say that creative prompts like Art Dice encourage mistake-making in a safe environment. The stakes are low, and mistakes hold the capacity to lead to new ideas. When we talked about how Art Dice could be used as a team-building exercise, I kept thinking about how prompts like art dice have the capacity to break down cultural norms and allow us to experience our own unlimited potential. One interpretation is not necessarily better than another, and one person’s unique interpretation can inspire another person’s way of thinking. What do you think? Would you like to have a set of art dice to experiment with? You can learn more about Creative Confidence or order a copy today. It’s been a while since I’ve done a round-up of creativity and education resources, and since a few pieces of interestingness have crossed my desk this week, I wanted to take a minute to share these great resources with you! I hope you enjoy them and that they give you some food for thought. And if you’ve spotted any great articles that you think I should know about, please let me know about them in a comment! This post on ArtsBlog from Kristen Engebretson of Americans for the Arts has some helpful Youth Arts Month links. 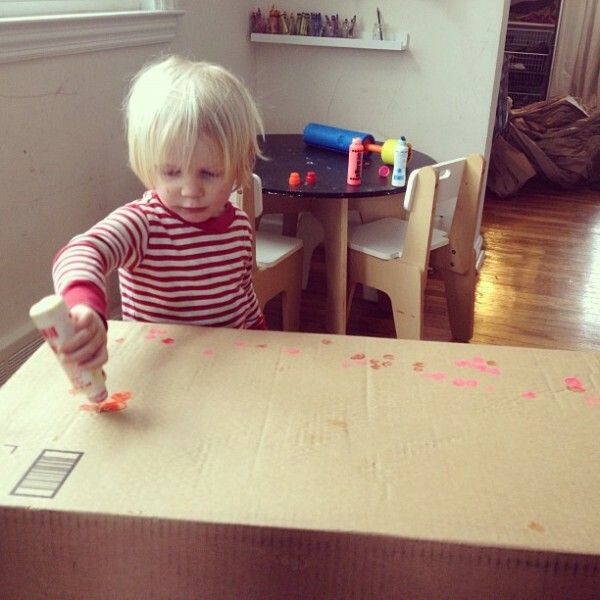 For anyone interested in the intersection of the arts and early childhood, later this month (March 18-22), ArtsBlog will host a Blog Salon about early childhood education, and I’ve been invited to chime in with some thoughts on the the value of process over product in the early years. More on that in a couple weeks! 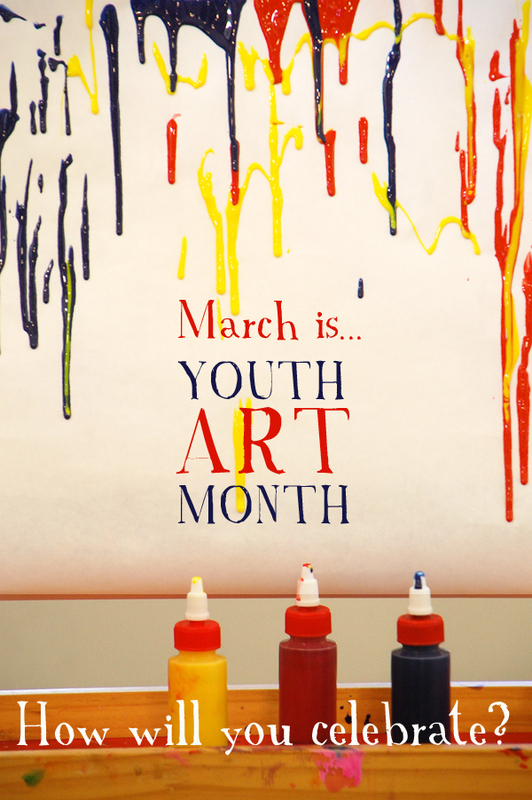 How will you celebrate Youth Arts Month? 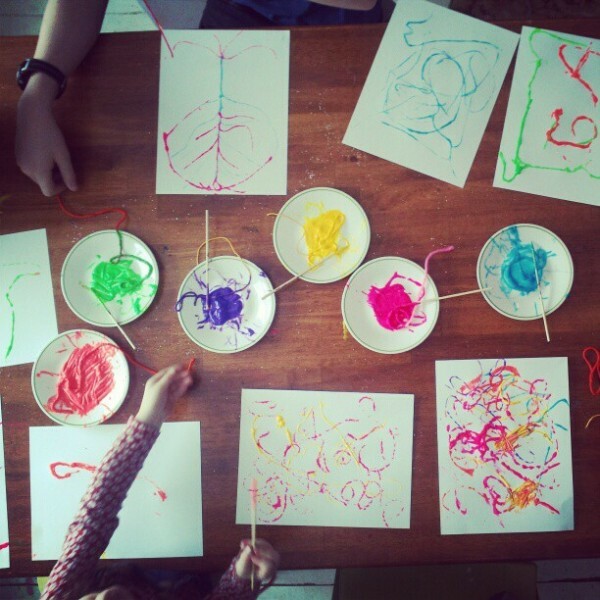 Sit down and make some art with your child. Subscribe to School Arts Magazine. If you’re a teacher or homeschooler, this is one of the best magazines on the topic. When I was a teacher, I always looked forward to finding this in my mailbox. If the arts are limited in your child’s school, can you advocate for more? Is there anything you can do to give the arts a bigger presence in your child’s learning? Set up a self-serve creativity zone in your home. Thank you child’s art teacher/s for their hard work and commitment toward making the arts a relevant and meaningful part of your child’s education. Have you seen this compelling video of Stephen Round submitting his letter of resignation to the Providence, Rhode Island School District? Since he resigned in December, 2012 it’s gone viral and has been viewed over 400,000 times. Round was a second grade teacher and resigned because he found that his school was so focused on standardized testing as a measure of student achievement that it missed the point of raising children to become lifelong learners, which is at the heart of his teaching philosophy. Stephen’s story isn’t a new one, but his heartfelt letter is worth watching if you care about how teachers can find their own unique and creative voice in a public school system that’s caught under the net of standardized testing. My oldest child enters kindergarten this Fall and stories like this have me on edge about sending her to public school. If teachers like this are resigning, school boards and parents need to pay close attention. There’s a fascinating study on creative and education that’s just emerging from the Learning Research Institute at California State University San Bernardino. “Kaufman and Beghetto suggest teachers should meet unexpectedness with curiosity. Rather than shutting down a potentially creative solution to a problem, explore and evaluate it. What seems like a tangent could actually help other students think about the problem in a different way. This is an interesting read for any of us grown-ups who consider ourselves creative, but find that self-doubt holds us back from pursuing creative ideas. And it’s also a reminder of how important it is to encourage a child’s creative ideas without judgement. Note: There may be affiliate links in this article, but I only share links to resources that I love and/or think you’ll find useful. 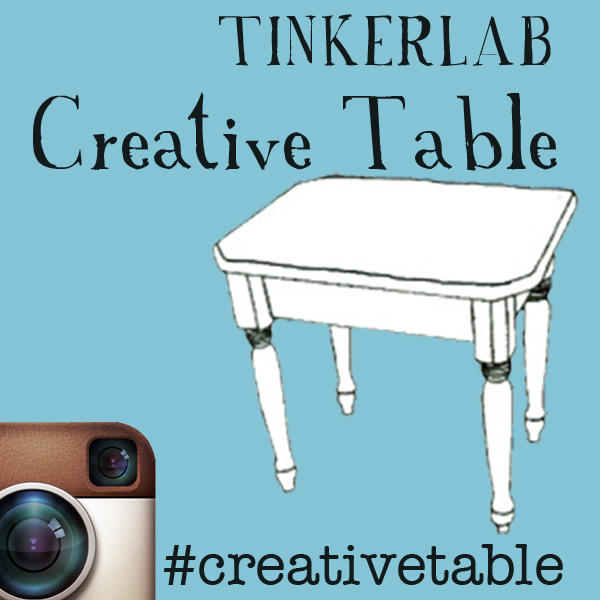 Do you know about the Creative Table Project on Instagram? 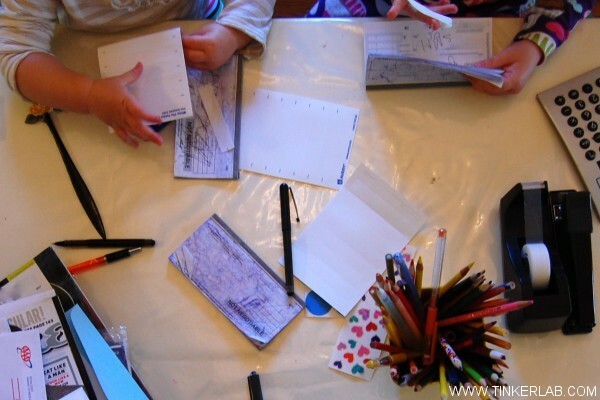 If you would like to see more creativity in your child’s life and if you’re interested in joining an inspiring community of creative parents who swap ideas, Creative Table can help! Last summer I invited my readers to share images of the creative things that are happening on their tables (or patios, backyards, sidewalks, etc.) as eye candy that we can all get inspired by, and then tag the image on Instagram with the hashtag #creativetable. The project began small, but it’s since grown into a thriving visual database of 750+ creative tables that continues to grow each day! 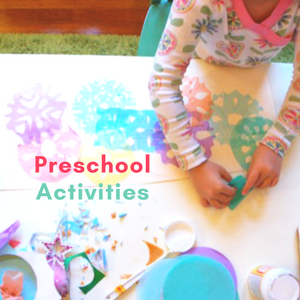 The range of ideas is great, which makes this especially fun and full of surprises: There are projects for babies and kids, science experiments, open-ended art making, seasonal crafts, sensory experiences, and cooking activities…just to name a few. Not only is this a rewarding way to document the creative happenings in your home, but having the project in the back of your mind can also help you look for opportunities to build more creativity into your daily rhythm. Plus, the scale of the project now makes it a cool tool for gathering inspiration. 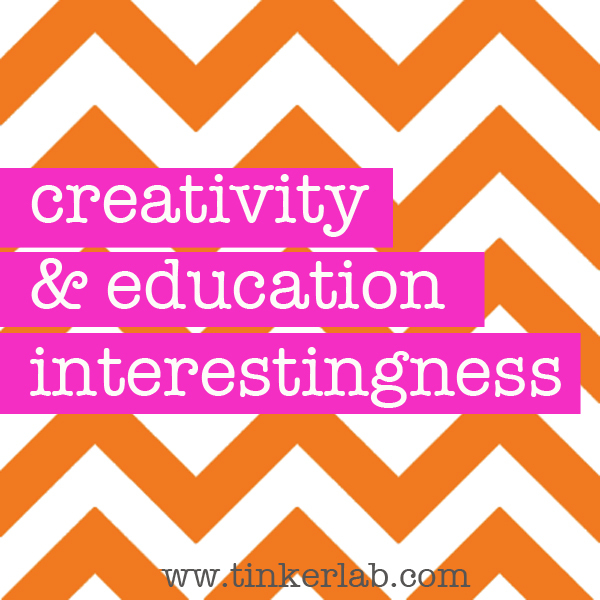 I know of one reader who checks in every morning to scroll through images tagged with #creativetable as a way of finding ideas that she can use that day. If this is new to you, or in case you’re not on Instagram, here are some recent highlights from the Creative Table project. If you’re on Instagram and would like to play, we would LOVE to have you. Please read these guidelines first, and then be sure to add the hashtag #creativetable to your image. A note about the images: Beneath each photo is the name and Instagram handle of the person the image belongs to, and any descriptive text that they added to their photo. I hope that these images inspire you as much as they inspire me! Note: Planting a Rainbow is the book in the image. 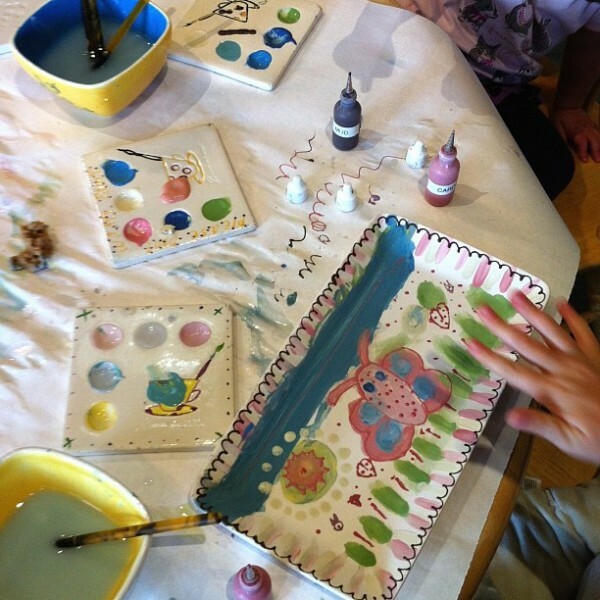 You can’t beat a paper plate for craft……. 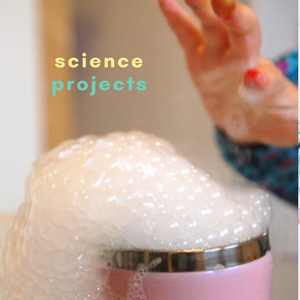 Here’s the cloud dough recipe that inspired this activity. So, what do you think? Will you join us? If you’re a participant, you’re welcome to grab this button and add it to your posts or sidebar. Note: This post may contain affiliate links to products that I adore or that I think you’ll find useful. 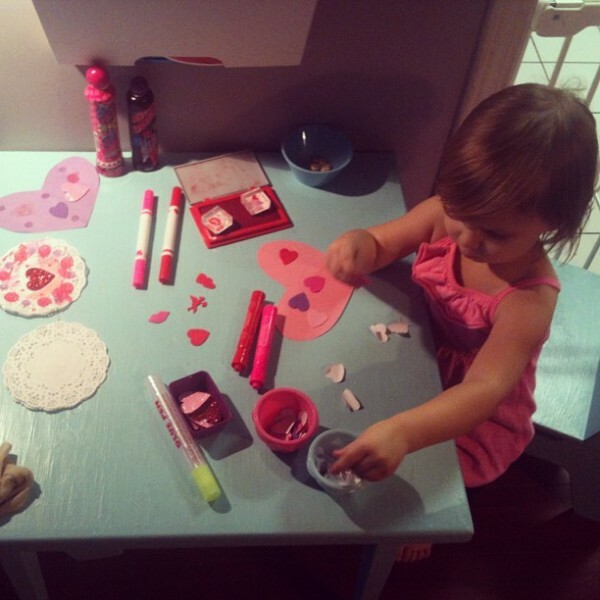 If you’re afraid of a mess, I have to warn you up front that this is a messy one. But it’s not a dirty kind of mess and if you stick with me here, you might become a shredded paper convert like me. It all started innocently, and rather boring, enough. It was a bill-paying day, and I set the kids up with their own stack of mailing labels stickers, pens, and old checkbooks while I dealt with the heavy stuff. I had basket full of old bills that were ready for the shredder, and two happy-to-please assistants who took the shredding job very seriously. 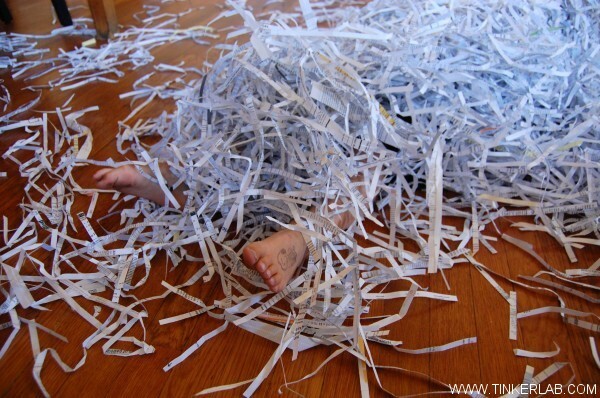 Shredders are potentially dangerous, and I would absolutely not let my kids shred on their own, but with careful supervision the act of shredding can build confidence, teaches accuracy and careful attention to details, and it’s just plain fun to make a loud ruckus. When it’s not in use, I unplug the machine and lock it in a closet. 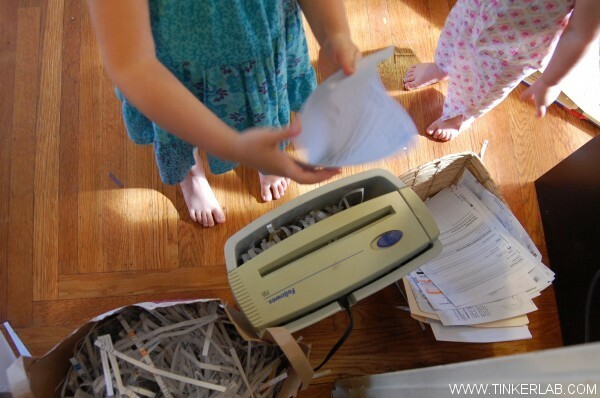 When it’s in use, I run through the rules of good shredder usage with my three and a half year old: Up to 3 sheets at a time. 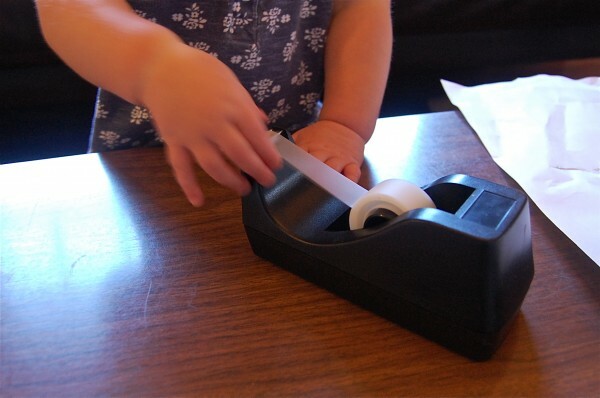 Hold the paper at the top when you feed it in (no fingers near the shredding area). And it’s not for my 18 month old. While my three year old shreds, her sister hands her stacks of paper. They love it. Okay, so take a look at that little basket of paper up there and remember how small it appears. And remember that appearances can be deceiving. And that’s only half of the paper. They could not have been happier. In fact, just before this moment, the kids were all winding down and ready to go their separate ways. But as soon as that bag emptied out, they found a whole other hour of play inside their little souls. It was so fun, in fact, that my older daughter chose to keep playing rather than go to her beloved gymnastics class. 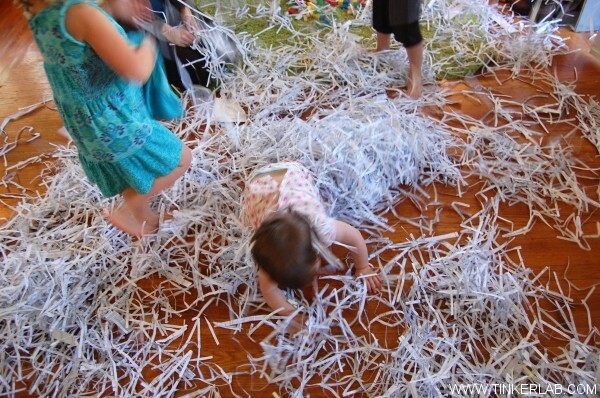 My friend is a master at imaginative play with kids, and had them bury themselves in shredded paper, pretend they were dormant volcano monsters, and then erupt without any notice. You can probably imagine the shrieking and laughter that followed. And we all agreed that this is the perfect toy: free, open-ended, and entertaining for a long spell. 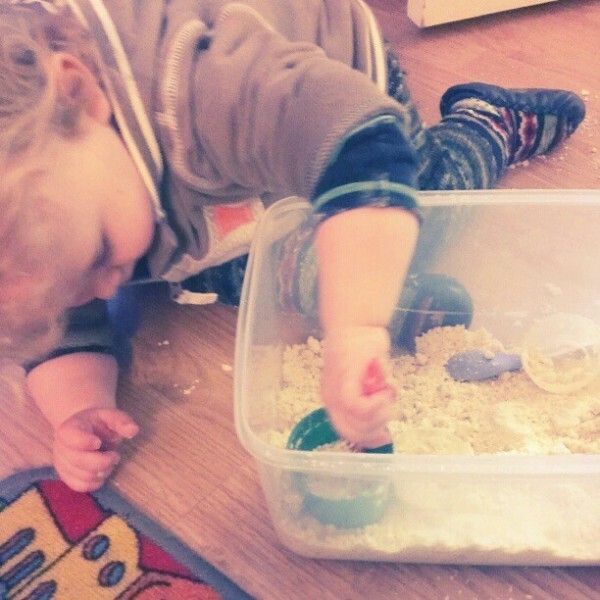 So it was messy, yes, but it was easy enough to sweep up. And rather than cart it off to the recycling bin like I had planned, it all found its way back into the closet and ready for another day of fun. Alpha Mom makes a bird’s nest with brown paper bags. 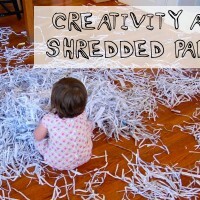 10+ Ideas on what you can do with Shredded Paper (like make animal bedding, papier mache, and mulch) from Bohemian Revolution. Adorable and seasonal Shredded Paper Seed Starters from Made. These are on my to-do list. Can you think of a time that your kid/s turned a banal situation into a burst of play? 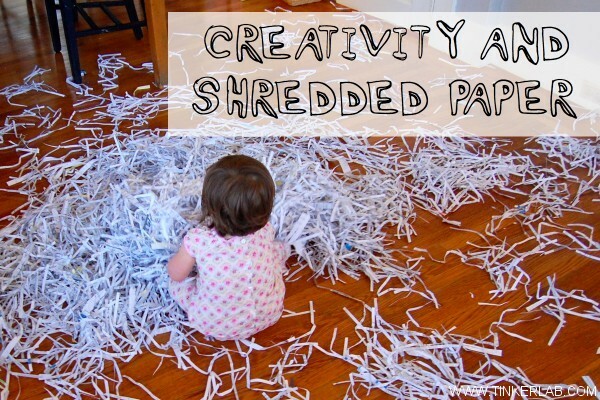 Have you played with shredded paper? Would you try this yourself? 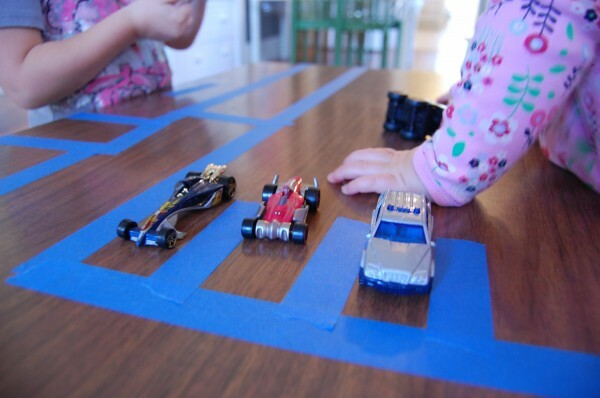 We love tape in our house, and it gets used for just about everything: taping up wax paper sandwich bags, taping labels to things, taping art table creations together, taping up marble runs, taping up whimsical installations. 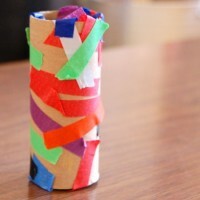 A roll of clear tape is a fixture on the art table and we have a big box full of colorful paper tape (this tape from Discount School Supply is amazing) that enables my children to realize some of their big ideas. And painter’s tape is irreplaceable for taping up furniture and things that can’t stand up to too much stickiness. 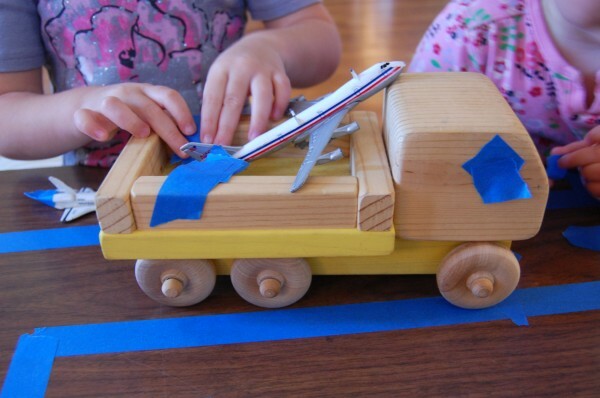 We have a basket of diecast vehicles thats almost never taken out, but my one year old wanted to play with airplanes so we got the planes going. 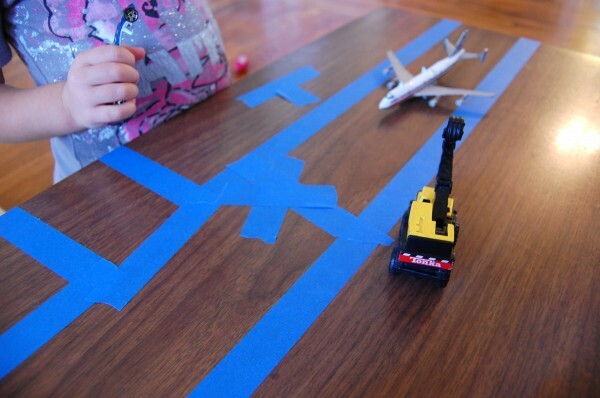 I saw this as an opportunity to “paint” some runways on our coffee table with blue painter’s tape. My older daughter thought this was a great idea, but she had her own thoughts as well. I’m sure that many of you can relate! 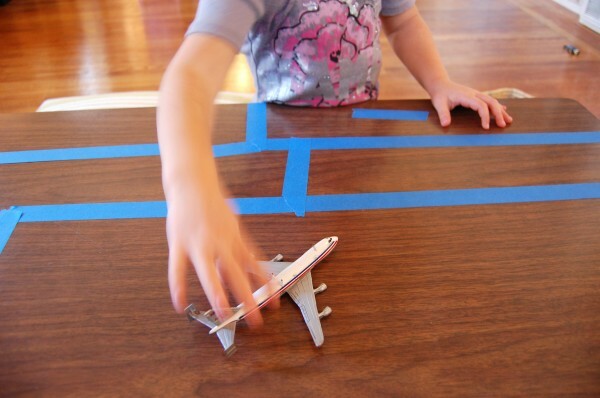 First, she requested shorter pieces of tape and blocked my runways off with those vertical lines you see in the photo. So, I abandoned my runway idea and made some cute little parking spaces. That was also shot down. N then blocked my runway with a big “X” so that the plane wouldn’t get away. I didn’t take it personally. And then I learned the real reason for all this independent thinking! Apparently a category 5 hurricane was on its way, and the plane was in danger of getting blown away. For extra safety, it was securely taped to the back of a large truck whose windows were also taped shut. You know, because windows can shatter in a hurricane. so that they wouldn’t blow away. And all this started with a little bit of tape. Now isn’t that a great way to spend $3?! 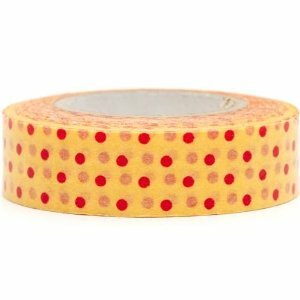 I really want to pick up some washi tape like this. Have you used it? Do you have a favorite brand? What about you? Would you be lost without tape, too? 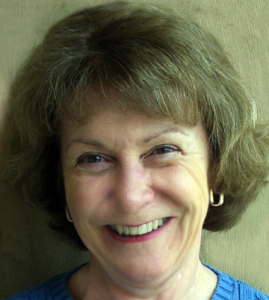 Today I’m excited to be joined by the ever-inspiring children’s art book author, MaryAnn F. Kohl. MaryAnn’s books helped me prepare lessons in my teaching days and have since become dog-eared favorites in my life as a parent. I now own eight of her books and constantly turn to them for ideas. Because MaryAnn is so prolific (full list here, on Amazon ), we thought it might be fun to spotlight one of her books as an introduction to her work. And…it happens to be MaryAnn’s birthday today! Happy Birthday, MaryAnn! RACHELLE: Welcome, MaryAnn! As you know, I’m a huge fan and your book, First Art for Toddlers and Twos: Open-ended Art Experiences, was the first place I looked for inspiration when my older daughter was old enough to draw. We’ve been having fun trying different activities from your book, Storybook Art. A lot of the books are traditional favorites, while some are new to me. How did you choose the books that are included in this book? MARYANN: Storybook Art was a joy for me to research and write. Choosing books was at the same time both easy and challenging, because I knew which books would have great art connections for kids, but how to choose 100 or less? As I sorted and chose, I was looking for a wide mix of art styles created by the illustrators, as well as a variety of art experiences for the children. 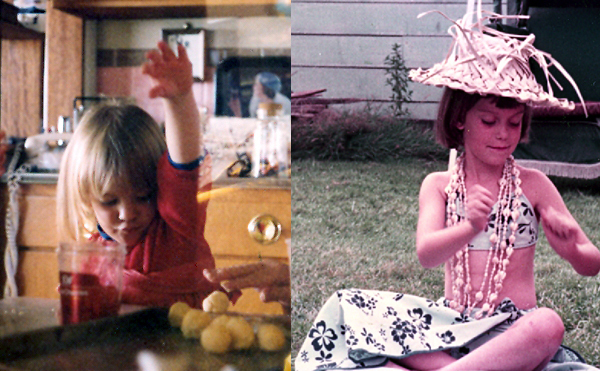 I wanted to be sure I had a good mix of paint, crayon, sculpture, photography, and so on. And of course I had my favorites that I simply could not leave out, like Ezra Jack Keats’ Snowy Day and Leo Lionni’s Fish is Fish. Everyone who knew I was working on the book had a favorite and begged me to include each one! Definitely challenging. When all was said and done, I arrived at 100 books and their illustrators selected in four categories (the four chapters): Paint, Draw, Cut & Collage, and Craft & Construction. I was pleased with the balance and only had to omit a few of my very favorites, but perhaps another book one day? I spent hours and hours in our public children’s library so I could see the real books up close. One of my favorite parts of writing the book was interviewing illustrators and getting quotes from them about why art is important. RACHELLE: It’s evident that a lot of time and research went into gathering biographies and details about the illustrators’ artistic processes. How do you hope parents or teachers will use this book? MARYANN: I offer the details in Storybook Art to parents so they may choose how much their children may be interested in knowing, and how much to share with them. Some children will be fascinated by the quotes and lives of various illustrators, and others will be more interested in just getting on with the art. Parents often introduce a little tidbit of information at one reading, and maybe a few more details at another reading. Whatever is comfortable each parent and child is what works best. I hope that parents will find picture books that their children enjoy, then explore the art project that relates to that book, and then, most important of all, re-read the book again (and again). 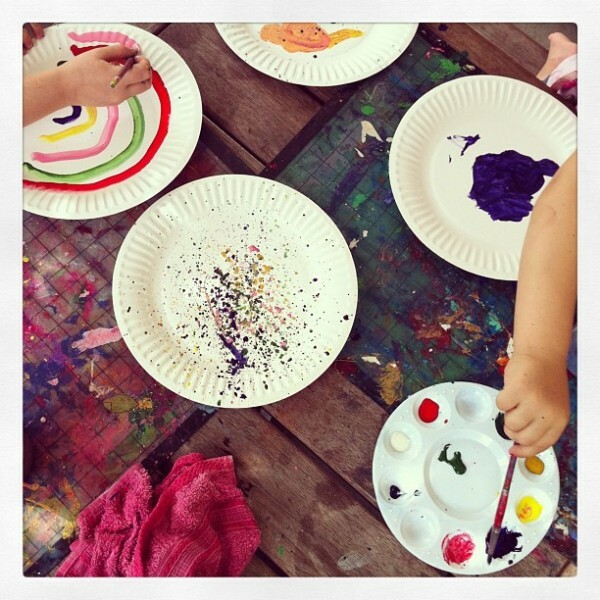 Parents will find that after their children explore the art projects, they will be more interested and more finely tuned to the details of the illustrations and the story when read a second and third and fourth and however many times. RACHELLE: How can the process of following up a story with an art project contribute to a child’s language skills? 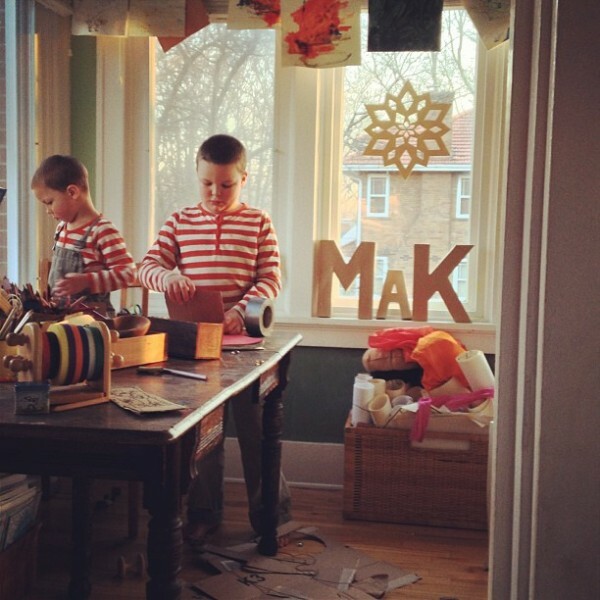 (Sharing some photos of our experience with Watercolor Snow Collage: Ezra Jack Keats). MARYANN: Picture books rely heavily on their illustrations, their art, if you will. Connecting picture book art with children’s own art connects children to their books. When a child has a personal connection (in this case, through hands-on art experiences) to a book, that book becomes more deeply appreciated, the story more deeply comprehended, the language more readily remembered, the illustrations more finely noticed. So much of learning to read is hearing a story and finding a personal connection. If art is a connection, it’s just one more way for children to become attached to their books in a personal way, with all the benefits that go with it. When we surround our children with books, and therefore with words and language, we are giving them meaningful vocabulary they will add to their use and understanding. The conversations we have with out kids about books increase their listening and communication skills. Including body language like facial expressions and clapping or other movements, helps get the words into the children’s bodies, and therefore will be remembered. 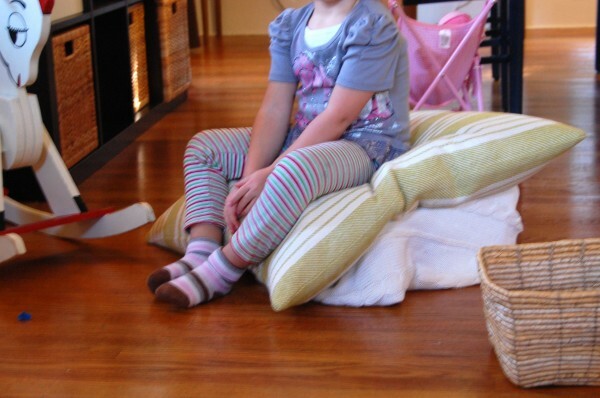 Children will often retell stories, or make up new stories inspired by their favorite books. We’ve all seen kids who memorize a book word for word, or at the very least know which words are next in the sentence before you read the words … all this long before they can actually read. This is a sign of a budding great reader! All these are amazing language skills that will launch a child into reading when he is ready. A little story: I remember at one point in my teaching career, I was talking to my kindergarten class about all the details of forest animals, just talking and talking, and this little boy raised his hand as he threw up his hands in the air with an exasperated look on his face, “….and rain makes applesauce!” He was referring to the chant from the book “Rain Makes Applesauce” that we had read in class, and letting me know I was just going on far too long with far too many details about forest animals. That one made me laugh! Kids will transfer phrases and words from their books into their lives, a connection transfer that makes those brain synapses just snap and sparkle! When this happens, you know that language has taken root in your child’s mind and heart, and will expand his creative thinking as he grows. RACHELLE: What are your favorite illustrators and activities from the book? MARYANN: My favorites vary from day to day, and from child to child. Whenever a child is inspired and excited about a project, then I become equally excited, so my favorites change often! There are some projects in Storybook Art that are sure winners for just about every child. For example, most kids really enjoy “Cat & Mouse Prints” that go with Wanda Gag’s classic “Millions of Cats”. They enjoy making “millions of prints”! another one young children love is Robert McCloskey’s “Blueberries for Sal” followed up with “Blue Fingerdots, which is simply making a painting with a finger dipped in blue paint, or better yet, blue dots art made with actual blueberries. One of the biggest surprises to me was a book that I added at the very end of the writing process because my daughter, Megan, requested it: Dare Wright’s “The Lonely Doll” with the project “Portraiture”. 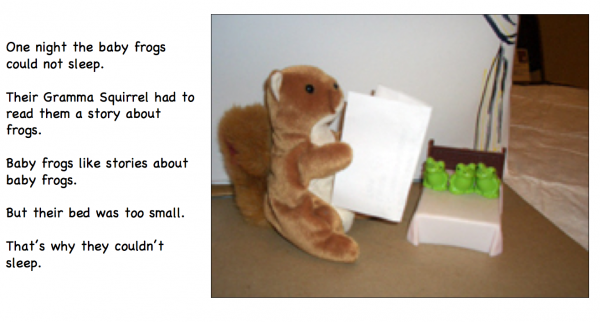 In this activity, children set up toys in various poses and scenes, and then photograph them, just as Ms. Wright did with her doll Edith and Edith’s companion Mr. Bear. Kids tell me this is one of their most favorite projects of all, and it’s fascinating to see the stories they put together through their photographs and scenes. I had no idea until I started doing portraiture with kids of all ages of the depth of creativity and concentration that would unfold. What a joyful discovery! 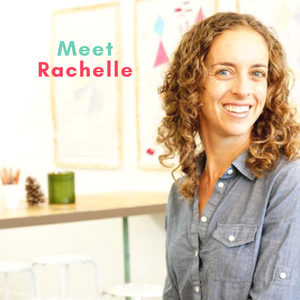 RACHELLE: I’d love to hear about your writing path. Can you tell us what influenced you to begin writing books and what you’re working on now? MARYANN: When I was a little girl, my dad owned a bookstore and brought home a Little Golden Book or other storybook for me weekly. My parents read to me every night, and during the day I read and re-red those books, often incorporating the stories into my make-believe and pretend play with my dolls or into my crayon drawings. When I was a little older, my dad managed a huge printing and book bindery, and I would spend a Saturday morning with him at his “office”. He would send me off to wander the shelves in the warehouse and find any books that interested me to bring home. His bindery did library bindings for every publisher in the USA, so the choices were magnificent! Little House on the Prairie was one of my best discoveries. It was pure luck that I found the series because no one had ever shared these books with me — not my teachers or the town librarian — and I loved the stories. Books were one of my most important activities as a child, along with my crayons and scissors, and my bike. Books remain important to me, and were clearly important in how I raised my children. I mention this, because growing up with books the way I did made me want to be an author. I always knew I would be one some day. I was in no hurry. I knew it would come about at some point. And here I am, 20 books later, with plans to write fiction for children who love “chapter books”. Right now I’m working on another activity book called “Great Composers for Kids” with my musical theatre writing daughter, Hannah. We’re coming up with some wonderful projects to help kids connect to the classical composers and their lives and music. It’s very exciting! When my kids started school, I decided to use the time when they were in school to write a book of art activities. I’d noticed that at the time no books existed, so I gathered my favorite “independent art ideas for kids” in a book called “Scribble Cookies”, now called “Scribble Art”. I self-published it with no clear idea of how to really do that, 27 years later, here I am! Scribble Art became an immediate best seller, and it’s still my favorite book of all the ones I have written. RACHELLE: You shared that your own girls are all grown up and have turned out to be amazing grown-ups. I’m so curious to know what your own home was like when you raised your children. MARYANN: My home was not unlike the ways yours looks and what you do with your children, though perhaps mine was not quite as magnificent in scope. I wanted my kids to have an imaginative childhood, so we always had art projects going on in our kitchen, lots of make-believe and storytelling, acting and pretending galore, costumes, dance, and singing. Making up songs was a big part of what we did together — just something that we enjoyed. My two daughters loved“Little House on the Prairie” on television and rarely missed an episode. 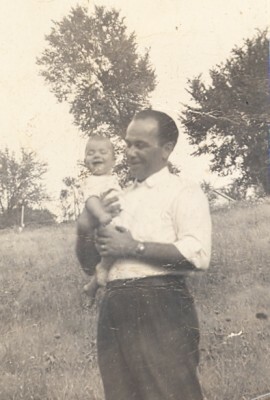 They loved Broadway musicals like Annie and Fiddler on the Roof and great classic fairy tales to listen to like The Little Mermaid (not Disney) and Snow White and Rose Red. Much of their creative play was based on these stories and shows. And now, my oldest daughter, Hannah Kohl, is living in New York and working on Broadway as a musical theatre writer and producer. 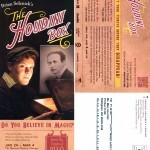 Her first professional children’s musical opens in January at the The Chicago Children’s Theatre based on Brian Selznick’s book, The Houdini Box. (Yes, I’ll be there for opening night!) Selznick is the author of the Caldecott Award winning book, Hugo Cabret, now an amazing beautiful movie called Hugo. I’m sure our love of books and fairy tales, etc. paved the way for her to seek theatre as a career. My younger daughter, Megan Kohl, does serious theatre performance in Chicago, and to our delight, was recently seen as the K-Mart witch in their national Halloween commercial. The most fun she’s had commercially was taping a travel DVD for Disney Resorts where she walks through the parks giving hints to parents about how best to enjoy the various Disney experiences. You can order the DVDs for free from Disney Resorts. Sing up here: http://www.disneyvacations.com/dv/en_US/VacationPlanningDVD/index Watch for Megan! RACHELLE: What books and blogs inspire you? 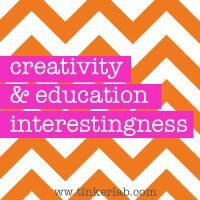 MARYANN: I follow many amazing blogs, and of course TinkerLab is one of tip top favorites! If I were to list several, they would not surprise anyone because I’m sure your readers follow them too: The Imagination Tree, NurtureStore, Chocolate Muffin Tree, Pink and Green Mama, Crafty Crow, Childhood 101, and The Artful Parent are some of the best that come immediately to mind. I am inspired and amazed at what young mothers are doing with their blogs and their fabulous photographs of kids in action and their wonderful artworks and adorable crafts. I am sure I would have been a mommy blogger if that technology had been available to me when I was raising my kids.As far as books that inspire me, I have shelves full of activity books and love them all for different reasons. I continue to especially enjoy Kim Solga’s“Paint!” and “Draw!”, books filled with open-ended art ideas and great illustrations and photos. I also like the more focused books put out by Chicago Review Press, like “Monet and the Impressionists for Kids”. All the DK books are beautiful! A little series I like for young children in board book format is called “Mini Masters” by Chronicle books. If you look for these, check out “Quiet Time With Cassatt” by Julie Merberg and Suzanne Bober. RACHELLE: Is there anything else you’d like to share? Lastly, I’d like to remind everyone that art for kids doesn’t have to be fancy or expensive or fabulous every day. If you give kids blank paper and crayons, you have given them the best possible. 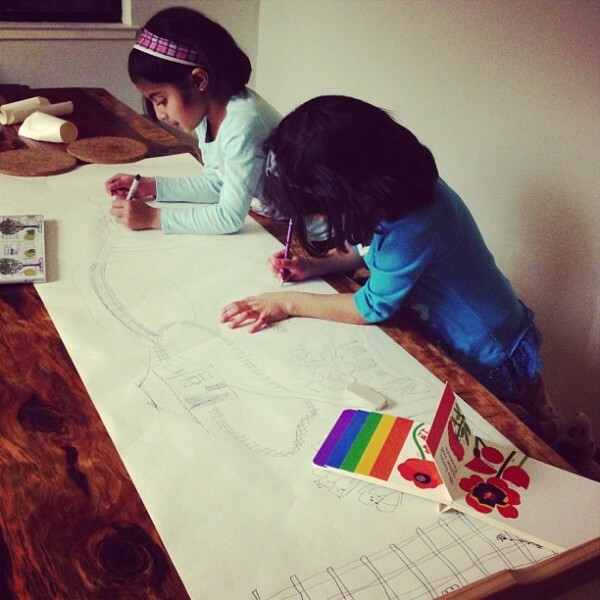 Did you know kids who draw frequently uninterrupted by adults do better in academic subjects? It’s true! 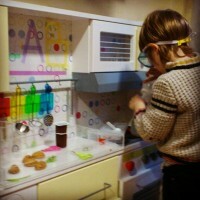 The important thing is to allow kids to create in their own ways. Relax and enjoy art with kids. The benefits are tenfold. RACHELLE: Thank you for joining me today, MaryAnn! Talking with you is always such a pleasure! What are your favorite storybooks? How have you been inspired to spin books into art project? 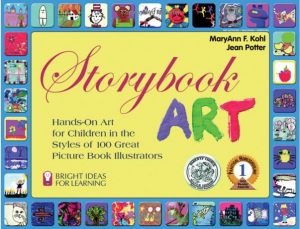 MaryAnn has graciously offered to share a copy of Storybook Art with one lucky reader. Readers who leave a comment by Monday, January 30, 2012 at 9 pm PST will be entered to win. Winner will be chosen by random number generator. Only open to U.S. addresses. The winner has been selected. Thank you to everyone who entered! !